This is such a good idea, I'm going to go for Super Girl and read 16-20 books by female authors. 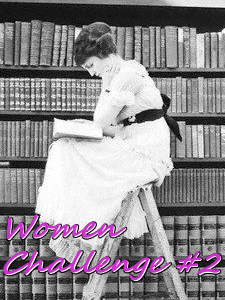 I might have to find a challenge for male authors. lol. 8 of my 9 books read have been by women authors. Ciao, non ho la pazienza di scrivere recensioni, però posso lasciarvi l'elenco dei libri letti. Amethyst was my 21st - this challenge is done!! I am joining your challenge for the first time. There are so many wonderful women authors. The first three that come to mind are Jacqueline Winspear, M.C. Beaton, and Penelope Lively. Welcome to the Women Challenge Catherine, thanks for joining! Ho inserito la recensione de "L'amica geniale" di Elena Ferrante, primo capitolo della serie omonima. Meraviglioso! I have now finished this challenge. I have added 22 books but two of them doesn't quite count as they have actually be written by a husband and wife. I will post a wrap up post some time next week. Ciao a tutti, buona lettura. I just completed the challenge :-) I'm gonna keep going though! @Saji Connor: bentornata e grazie per le recensioni! Thanks! I've now added two more reviews to the tally. Thanks for hosting, I'm def in for 2015! And I'll try to be more regular with reviews ^^""